In July 1990, the ambitious Economic Development Department of the City of Hamilton launched a waterfront festival, Aquafest, in hopes of drawing tourists to the city. But where exactly was Hamilton’s waterfront? Organizers selected Confederation Park on the shore of Lake Ontario as the site of the two-day festival. It featured water ski demonstrations on the lake, volleyball games on the beach, and musical bands playing near Wild Waterworks, the park’s artificial wave pool. Hamilton held this festival far from its west harbour’s waterfront in the city’s core. 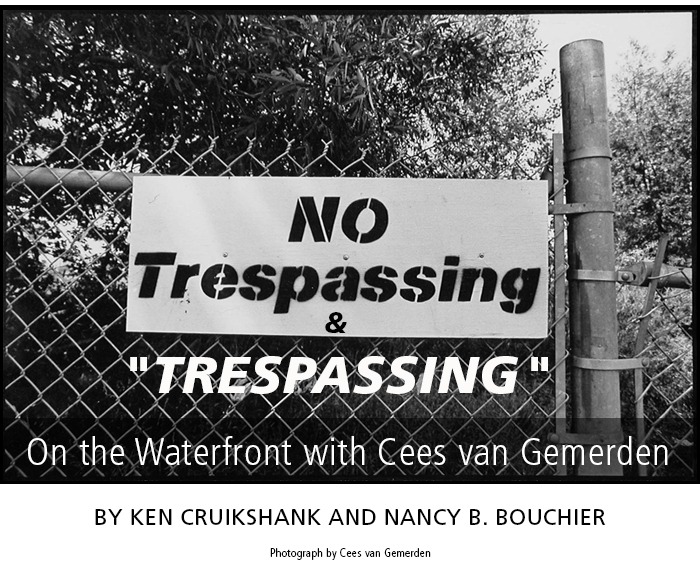 One year earlier, in July 1989, Cees van Gemerden had documented the conditions that made a waterfront festival on the Lake both necessary and tragic. Through 78 phototextual images, his “No Trepassing” exhibition showed how people in the city were cut off from their bay’s waterfront. Hamilton Harbour’s shore could barely be seen beyond a line of fences and locked gates. Cees’s work caught people’s attention.